Having enjoyed our stay in Camaret (thanks for the recommendations John and Jim) we dropped our lines from the marina there on Monday 16th August in fog which appeared to be clearing fairly quickly exactly as forecast. Five minutes later, the fog descended again very thickly, so along with several other boats, we picked up a mooring just outside the marina to wait for it to clear, as the first part of our passage through the Chenal de Toulinguet would be better tackled with some visibility. 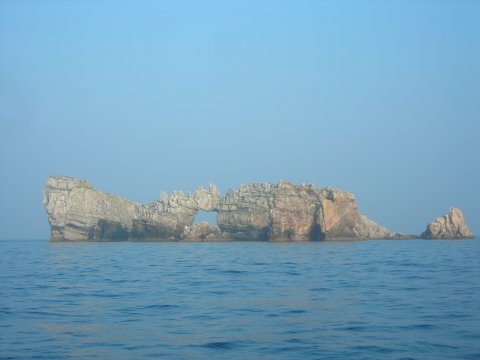 It cleared within half an hour, so we set off out of Camaret, through the Chenal de Toulinguet and toward the notorious Raz de Sein. 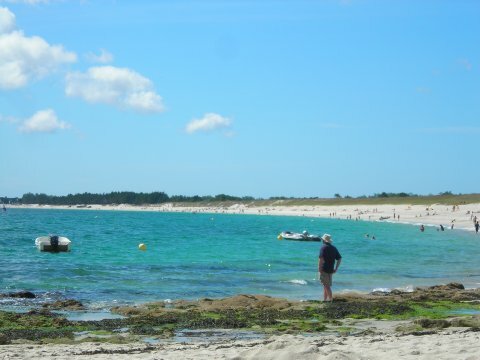 The pilot guide very strongly recommends the Raz de Sein be tackled at slack water, in fair weather, and not with wind against tide. The slight delay with the fog meant we would reach the Raz past slack water, however both the wind and tidal stream were with us, the wind was very light and the sea calm. The wind picked up enough for us to set sail, so we were confident that we'd easily get through the Raz, which is actually only a couple of miles long, well before the tide turned. 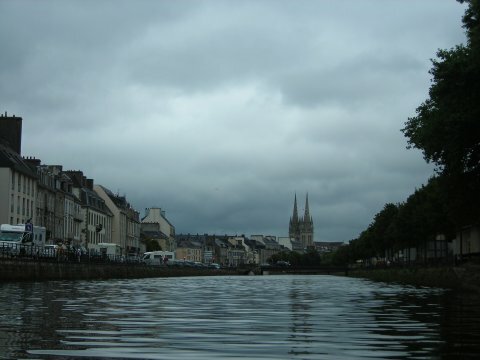 We could see the turbulent waters of the Raz ahead, rather disconcerting in such mild conditions. We could only imagine what it must be like in poor conditions which would make it a definite no-go, not a case of 'not for the faint-hearted', but downright not for anyone with any common sense whatsoever! We passed through without incident, other than having to start the engine to power through it as, despite having just enough wind on our quarter to fill the sails, the tidal race was taking us through quicker than the wind, making the sails collapse, so we were losing steerage way. 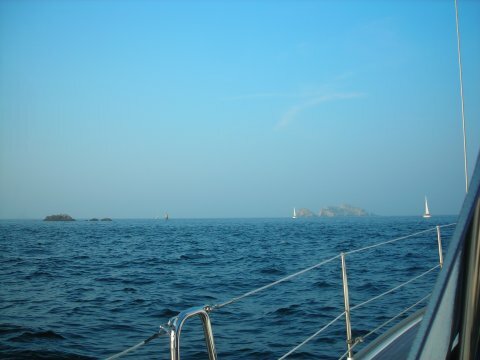 Once clear of the Raz de Sein, we turned onto a more easterly course and within 15 minutes lost the weird effects of its tidal races, whirlpools and overfalls and had a lovely sail to our overnight stop at Sainte Evette, just outside Audierne. There seemed to be some conflicting information about the depth inside the marina at Audierne, so we erred on the side of caution and stayed on a buoy in Sainte Evette. 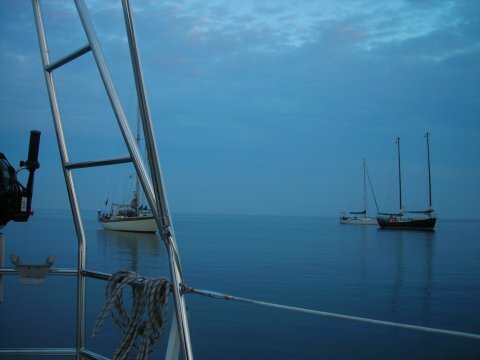 As the wind was north westerly, the anchorage was well protected and extremely calm, particularly as the wind dropped completely in the evening. Despite being slightly cool still, it was a beautiful evening to fire up the Cobb barbecue. 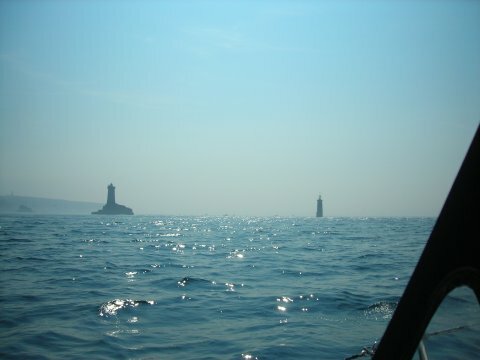 We roasted chicken legs and green peppers which we had with some home-made coleslaw for dinner, then cooked sausages for lunch the next day, when we planned to sail past Eckmuhl lighthouse on Pointe de Penmarc'h, which is apparently the gateway to South Brittany. 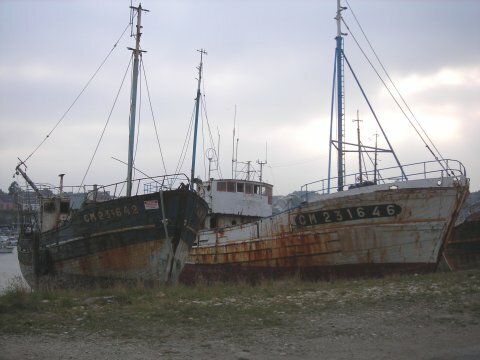 The much photographed and forlorn hulks on the sillon at Camaret. 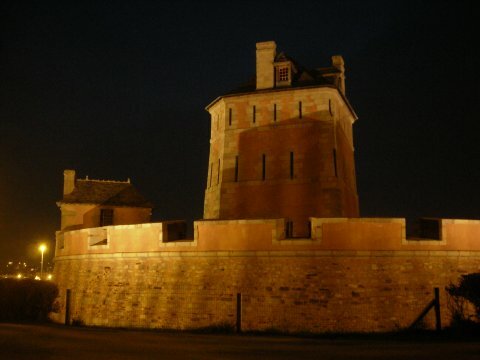 Camaret's Fort Vauban at night. ...inside this and some other rocks! La Vieille and La Plate lighthouses, Raz de Sein. Even in benign conditions, you can see the turbulent waters that are the Raz de Sein. On Tuesday 17th August, we were hoping to be sailing into more sunshine and temperatures higher than the 20 degrees that had been about the best we'd had over the last few weeks. Frustratingly, the morning dawned very grey with drizzle and rain which continued through most of the day, so we didn't see the coast or even see the Eckmuhl lighthouse as we passed less than a mile off! 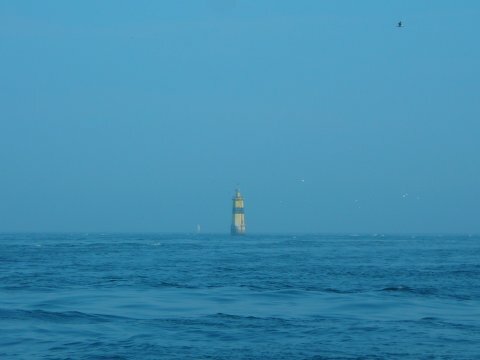 There was a fair sea and swell running with a good F4-F5 blowing, but reefed down, Pipit romped along oblivious to the drizzle and rain whilst we did our best to enjoy what was, other than being so wet and having no visibility, a really good sail - after all, we were now sailing the Atlantic coast of France! It wasn't too cold, although we were rigged in full wet weather gear, but it wasn't what we were expecting for our sail into South Brittany! 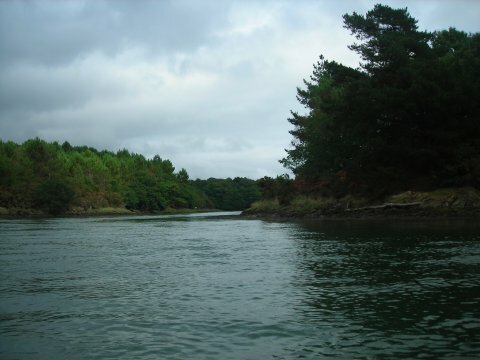 Shortly after we changed course slightly eastwards towards Benodet, the sun finally began to break through and we were more able to relish the sail to the entrance of the River Odet, cracking along at 7-8 knots. 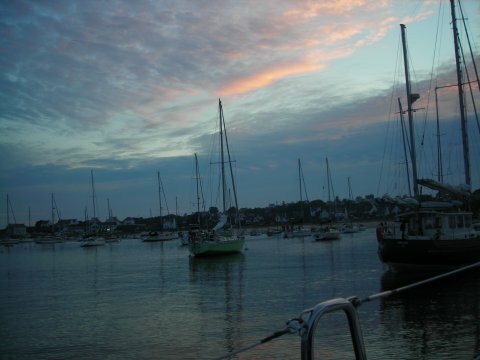 Having read the Pilot Guide, we had decided to go to the marina on the western side of the river at Sainte Marine instead of the marina in the larger town of Benodet on the eastern side. Exactly as the guide said, a helpful chap in a marina launch came along, directed us to a finger berth and took our bow line - a finger pontoon with cleats and long enough that we can use the side gate instead of clambering aboard (a very high step for Ann) at the shrouds - it's the simple things in life that make a difference! 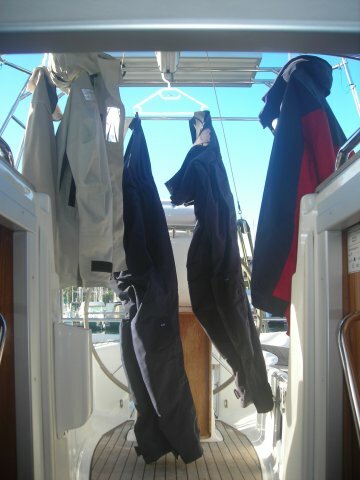 We hung out our wet weather gear and had hot showers aboard, before reflecting on the day's sail over a few beers. 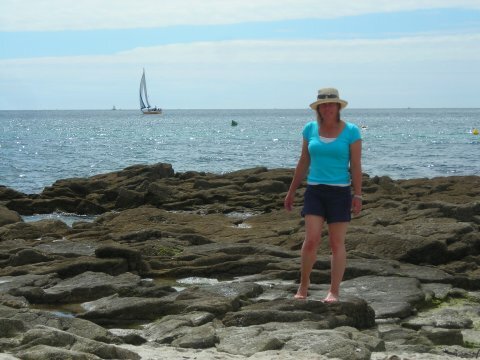 Not the clothing we expected to be wearing in South Brittany in August! The next day the sun came out at last, Andy's birthday and our first full day in Southern Brittany - were we finally going to get the temperatures expected in August? It was warm enough for us to walk along the coast path to Pointe de Combrit and beyond to the beach. 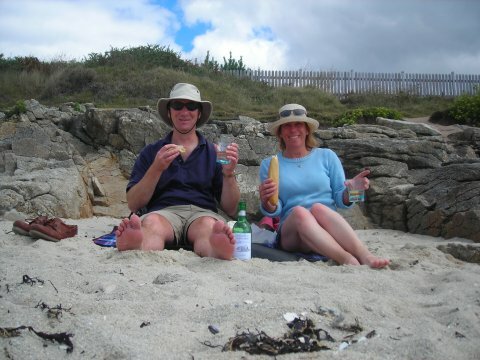 We had a wonderful few hours lazing in the sun, savouring a picnic lunch French style - du vin, du pain, du fromage et du jambon. Tres bon! 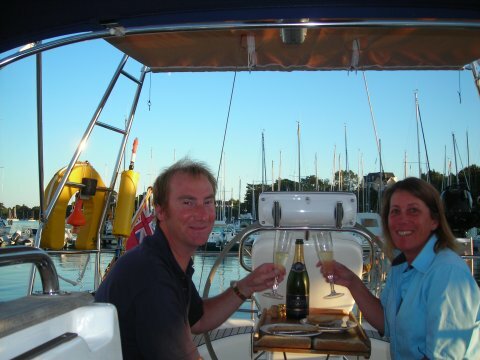 It seemed very appropriate that we toasted Andy's birthday and our first full day in South Brittany with the bottle of champagne very kindly given to us (at the Northney marina excursion we went on) for our first Channel crossing, which we did on Ann's birthday. 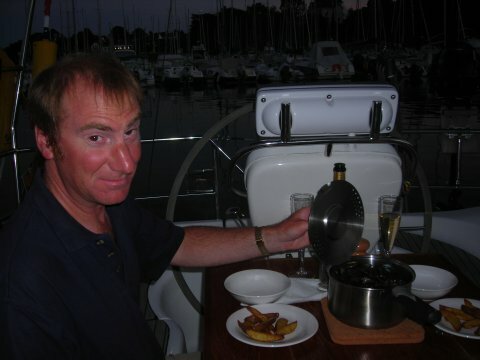 Birthday dinner - we've found we can easily do moules-frites aboard. Moules are available just about everywhere and very inexpensive - normally 4-5 euros for a kilo which is plenty for a main meal for two. 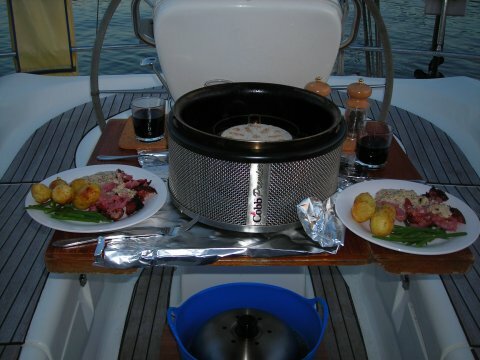 We can cook them on the Cobb using the frying dish or in a pan on the stove. For the frites we either use frozen ones bought on the day from the supermarket (no room for anything but ice in our tiny freezer compartment) or home-made potato wedges roasted in the oven. These moules were cooked with Breton cider - very tasty! The next day was back to less than summery weather, some sunshine, but a fresh and surprisingly cool south-easterly breeze. We took the opportunity to remove the bow plate to inspect for damage after the incident in Camaret. We were very pleased to find there was only some very slight crazing of the gelcoat, which we proceeded to sand and refill. 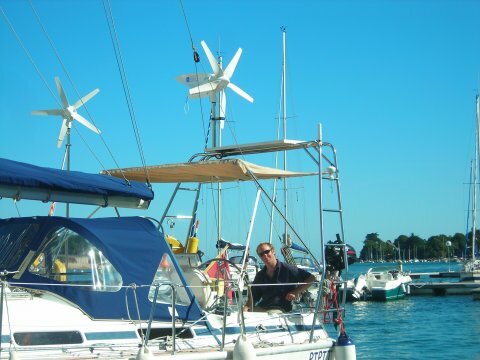 We'll check this again over the winter, but at least now there isn't a nagging doubt of a potential problem lurking under the bow plate. As we have now done over 100 engine hours since the last service, we needed to do an engine oil and filter change. Andy could, of course, do this himself but we would have to buy a pump to drain the old oil and container to put it in, both of which would need to be wrapped up and stored somewhere aboard. On this occasion at least we decided to get a Volvo dealer to do it for us and we had already looked on the internet and established that there was one over in Benodet. So, the next job then was to study the French in the very handy yachtsman's ten language dictionary to get the right terminology to ask the Volvo dealer at Electro Marine if they could do this, explain that our boat was across the river in Sainte Marine, ask how much it would cost and when they could do it. Between our poor French and the engineer's good English we managed to get the job booked for 0830 the very next day. There was some confusion over the oil filter as the one we knew was fitted differed from the one the marine engineer was saying was the correct one, even confirming this by showing us the Volvo parts manual! The good news was that this part of the conversation was held in English. We said we'd double check with our engineer (thank you again and high recommendation to John at SMS in Plymouth - turns out they are interchangeable) and the engineer would bring both with him, fitting whichever one we preferred. He duly arrived right on the dot at 0830 and we were able, with the help of the aforementioned dictionary, to get it all done and sorted. 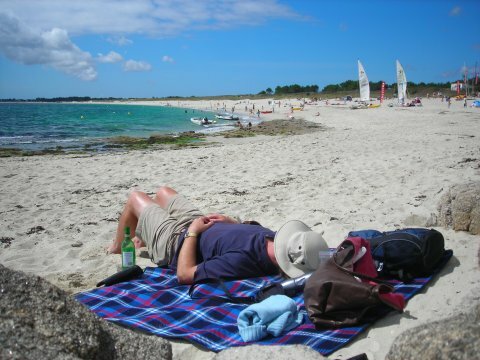 Andy then headed off to the office and Ann headed across to Benodet to the supermarket. 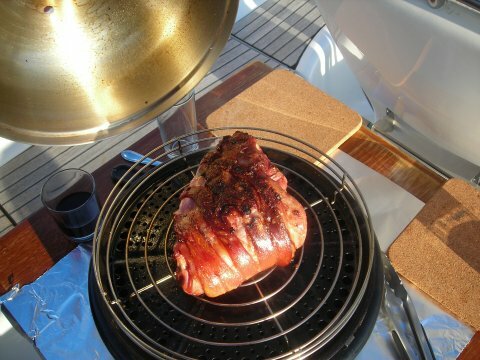 And another Cobb success - roast gammon joint. L'Odet river, en route to Quimper in Nessie.